Channels determine how products are sold and - more generally - how they are presented to the outside world. Whenever a product is booked in TourCMS (whether drect by customer, member staff or via an agent) it will be booked via a channel, similarly when a product is viewed externally on a website or via the Marketplace it is being viewed via a channel. Thus having multiple channels gives you the flexibility of presenting the same core products in a variety of different ways and also applying settings / changes broadly to multiple products from a single location. Each TourCMS account starts off with a single channel, many accounts never need to create any more. Having multiple channels does increase complexity, however it also enables complex business processes and setups. Running staff bookings, websites, Marketplace connections and agents all via one channel is fine in many cases. Read on for some examples of when creating additional channels may be required. One channel that covers a broad range of activities on one brand and another with a separate brand focusing on say rafting. By default all channels will feature all Tours/Hotels, however it's possible to restrict which products a certain channel will feature via the use of Product Filters. To see / change your channels log in to TourCMS and head to Channel Manager, you will see the settings related to your default Channel plus a box at the top right hand corner which lets you switch between Channels. On this page you can adjust the design & other settings of the Booking Engine, if you are using TourCMS to manage your website content you can load and edit your CMS Templates or FTP settings and also control more general setting such as markups, currencies and languages. Further down the page (just past half way) is a form which lets you create new Channels. All paid accounts allow creation of at least one Channel, higher accounts allow for creation of additional channels and the page will tell you how many you have left. If you need more channels you could deactivate any you are no longer using or upgrade. Choose from one of the 22+ supported languages in TourCMS (contact us to request a new translation), choose date and calendar formats and optionally load your own translations for commonly used words such as "County" or "Firstname". Tip: Each step of the Booking engine also has words you may wish to translate / tweak, to access those head back out to the main Channel Manager page and click on the relevant page in the Booking engine section. Configure emails to be sent automatically to customers/agents making bookings via this channel. Including confirmation emails, balance due soon/due/overdue, pre-trip/post-trip etc. Learn more. Choose the Sales tax scheme (if any) to apply to bookings via this channel, whether prices should be taken from costs or loaded sales prices (optionally with a Markup scheme applied), the format numbers should be displayed in, the currency to be used, rounding rules (e.g. round prices to nearest whole number, nearest ten etc), deposit amounts and any booking fees. By default the channel will feature all Tours/Hotels, however it's possible to restrict which products a certain channel will feature via the use of Product Filters. If you have multiple channels for things like currency or language you may want to provide the customer a choice of channel when they make a booking (presented as a choice of currency or perhaps direct vs agent booking). 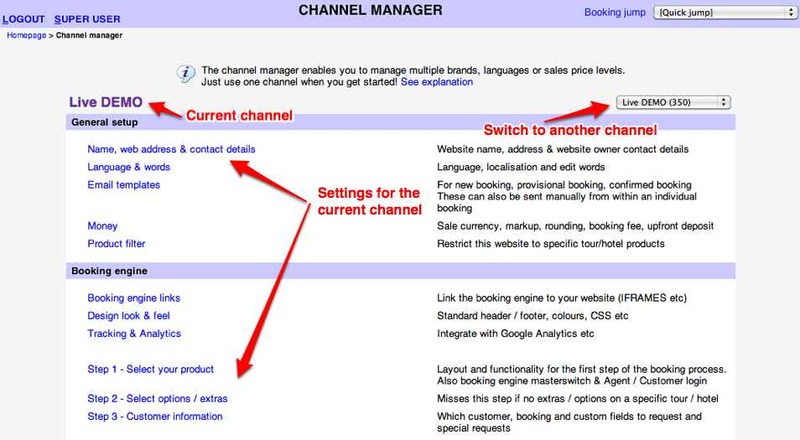 We have a tutorial on building a booking engine channel switcher.